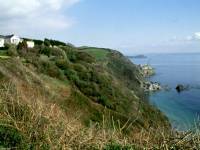 The section from Mevagissey to Porthpean is quite a short one but is full of interest and variety. 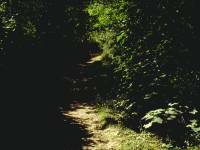 There are a good many steep gradients and a lot of ascent and descent, which makes the section relatively tiring and is the main reason for keeping it relatively short. 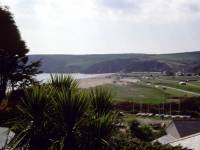 Starting from Mevagissey, you walk north across downy terrain to the Pentewan caravan park, then through the delightful village of Pentewan itself. 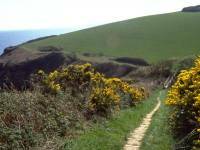 After Pentewan comes the tiring gradients of the Porthowan estate and the wooded dell of Hallane, bringing you to Black Head. 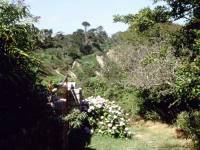 You then walk through woods adjacent to Ropehaven, before coming out onto another rollercoaster cliff walk past Phoebe's Point and Silvermine Point. 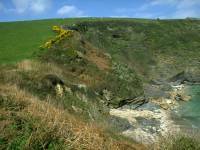 The cliff walk ends at Porthpean beach. 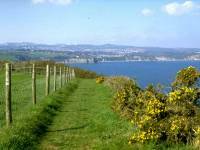 This section ends at Carrickowel Point just beyond Porthpean, for the reason that this is the closest point of the coast path to the town of St Austell. 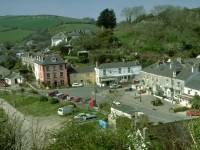 The town is an excellent place from which to tackle the walk as Mevagissey is a short bus ride away. 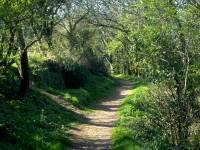 You could even make it a circular walk. 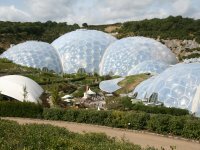 Those staying in the area are also recommended to visit the Eden Project just north of St Austell, a bold, imaginative and fascinating attraction centred on the world's biggest greenhouses and telling the story of Man's use of plants. 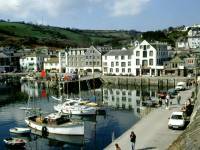 With a light day ahead, this morning is the time to explore Mevagissey if you've not already done so. 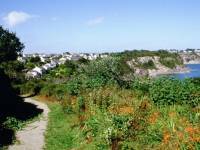 It's a place of steep and impossibly narrow streets, the first of four such places that you will meet on the coast path between Falmouth and Plymouth. 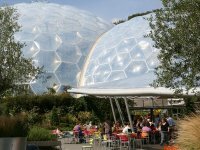 It markets itself to the tourist and day tripper quite unashamedly, but it also has a smattering of craft and antique shops, as well as specialist food outlets (seafood, Cornish pasties and home-made fudge seem to predominate). 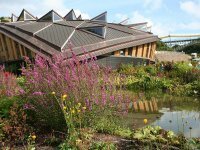 Fishing trips are available, and you might also wish to visit the aquarium and the model railway exhibition. 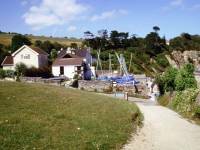 Leave town by way of the coast path leading off the north side of the harbour. It runs initially along a couple of steep narrow lanes, and you wonder - as you no doubt did when you came into the town on the other side yesterday - about how the builders of Mevagissey's housing stock managed to shoehorn so many properties into such small spaces at such crazy angles. 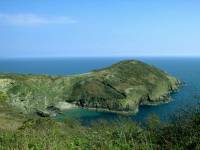 Who'd have though of building a cottage there? Who'd have though of accessing it that way? How do they ever get their furniture in and out if they move? 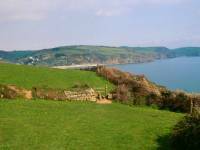 The outskirts of most of Cornwall's coastal towns are where you normally find a series of grand, secluded and handsome detached houses with dream gardens. 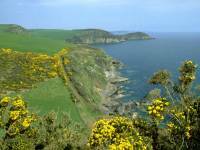 Mevagissey is an exception. 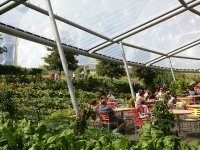 You find yourself crossing a nondescript open green surrounded by a couple of groups of rather utilitarian terraces. 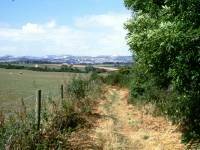 Beyond this section the scenery improves briefly as the path is hemmed in by tall conifer hedges to the west, then you're out in open country. 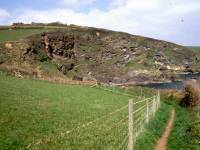 Immediately north of Mevagissey there's some 500m of mixed downland, pasture and heath that rises and falls quite alarmingly on its way out to the headland of Penare Point. 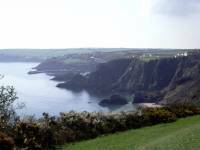 There's a good retrospective view from here of the impressive cliffs immediately north of Mevagissey harbour, and the coast back beyond Portmellon to Chapel Cove. 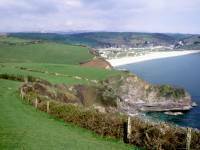 From Penare Point there's a view forwards over another stretch of undulating pastureland, beyond which is the white strip of Pentewan beach with its massive caravan park (that's trailer park for North American readers) immediately adjacent. 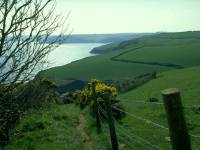 The coast path from here to Pentewan runs across a succession of open pastures and contains several steep rises and falls. About halfway to the beach from the headland you pass the locality of Portgiskey, apparently an abandoned settlement. 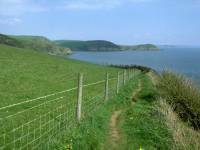 Continue your journey across the hilly pastures towards Pentewan. 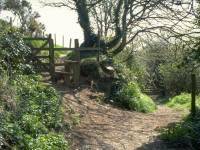 As the route is unenclosed around here you can pretty much please yourself where you walk, and there will not always be an actual path apparent on the ground, but the next stile or gate will always be in view. 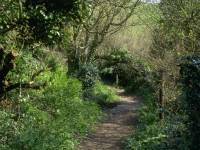 The path now comes alongside the Mevagissey - St Austell road, but rather than joining it it runs parallel along a bank, screened from the road itself by a line of vegetation. 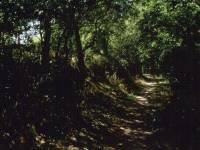 Eventually the path runs down to join the road just short of the caravan park. 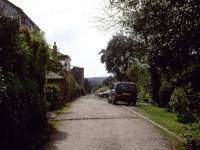 Walk along the road past the caravan park. 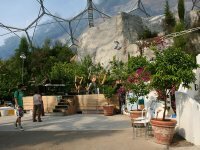 There's no entry to the general public so don't expect to be able to use the facilities, though backpackers might like to know that tents can be pitched here. 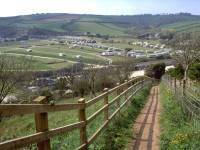 If you find the place too cramped and crowded, there's another campsite about a mile inland along the St Austell valley. 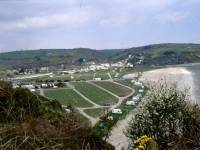 Beyond the campsite you turn left onto a short side road that crosses the St Austell river and passes a small area of mud flats to come into Pentewan village. 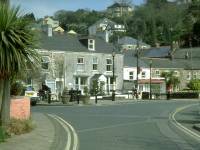 Pentewan village is a most pleasant little place. 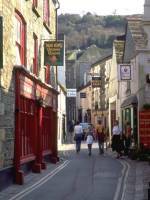 Compact, stone-built and grouped around a paved square, it has much of the character of a village in Yorkshire or Derbyshire rather than Cornwall. The only thing missing is a cafe. Go on past the square and then turn hard right onto the Terrace, a most unusual architectural feature. 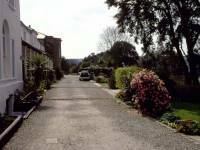 The Terrace features a row of buildings on the left (east) side of the road, with their gardens laying to the right (west). 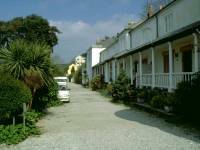 Many of the buildings, including the church just over half way along, feature a balustraded porch that gives the street a very Mediterranean air. 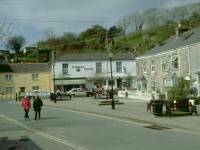 The Terrace overlooks the village square below. 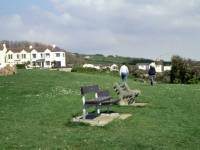 At the far end of the Terrace the coast path swings left and goes quite steeply uphill between fences. These fences are a feature of the next section, through the Porthowan estate, a section of classic "can't sit down" country. 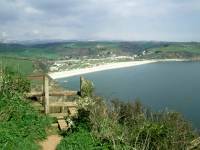 If you want a refreshment break take it here in Pentewan before you move on, because there will be no further opportunity until you reach Black Head. 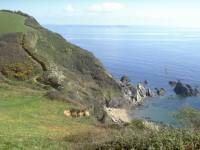 The Porthowan section of the coast path is rewarding for you're back among the wild, dramatic scenery of high cliffs and rocky coves, but it's a tiring stretch - there are many steep rises and falls and there is little respite. 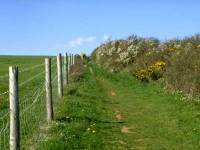 The constant presence of fences either side of the path becomes an irritant - scenery such as this should be liberating but the fences induce a sense of confinement that simply feels wrong. It's frustrating that there's nowhere to sit off the path. This section runs for about a mile and a half. 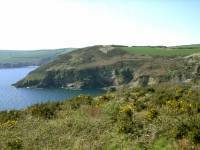 There are some rather good views back to Mevagissey and Chapel Point, and forward to Black Head. 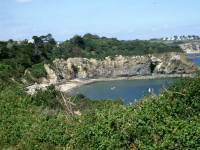 Nearer to is some impressive cliff scenery, though the gradients hereabouts are quite daunting. 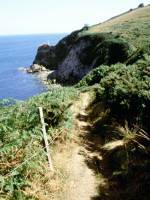 After one particularly steep ascent to gain the clifftop above the nameless cove pictured in the images above, the path runs along at a high level for several hundred metres before entering an area of woodland and running down to the cove of Hallane. 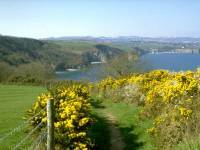 Hallane is lovely, and quite atypical of the rest of this section of the coast path. 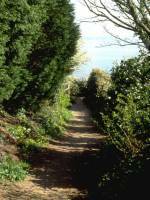 The woodland path descends steeply to a valley, through which a substantial path runs down to the beach to your right. 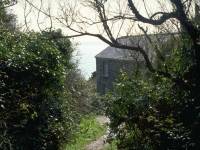 A cottage can be seen through the trees, though its short access drive, together with the adjacent cove and its tiny beach, is assumed to be private. 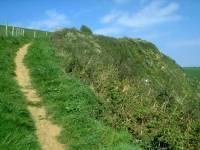 From Hallane the path rises steeply once again to reach the minor headland of Drennick. 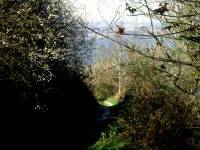 Hallane is seen to advantage from here, while just five hundred metres to the east is Black Head. Black Head is a strange little headland, an outcrop of rock proud of the coast and connected to it by a slightly narrower isthmus. The fences finally fall away as you reach the grassy isthmus, but it's not a good place to stop for a break as it's open to the winds from almost every direction. 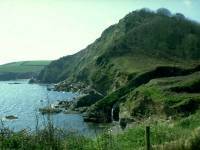 The head itself is a rough, scrubby place and its surroundings suggest an abandoned military blockhouse - half buried sunken walls of concrete and breeze block are everywhere, and you have to be careful where you tread. 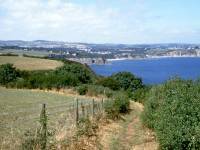 At least the views are good, particularly that forward into St Austell Bay. 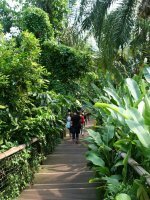 Make your way back across the isthmus and take the path from the eastern end, which quickly becomes enclosed by fences again. If you're still searching for that elusive refreshment halt, fear not because there is a bench seat coming up in half a mile. 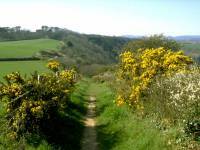 The path rises swiftly to climb the heights above Gerrans Point; you get the impression of magnificent cliff scenery falling away to your right but whatever's there is well hidden by a bank of gorse and scrubby vegetation. 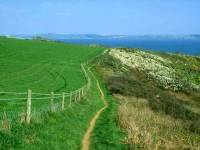 Grass pastures lay to your left just beyond the fence. 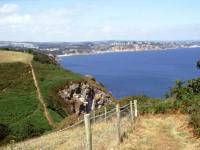 From the top of Gerrans Point the path descends and swings to the northwest, and here you get your first really good view of St Austell Bay (second image above). 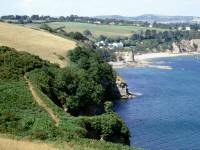 It's immediately apparent that the section you're approaching is far more heavily developed than any part of the coast you've seen before, except for the environs of Penzance and Falmouth. 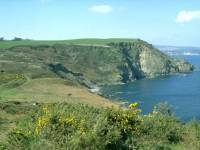 The predominant feature, some two thirds of the way round the bay, is the huge china clay works at Par, but west of these are several coastal villages (including Duporth, Charlestown and the Place With No Name) as well as the prominent Carlyon Bay hotel and its environs. 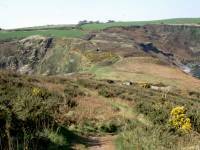 Inland is the strange landscape of china clay spoil heaps, towering above the surrounding countryside and shining white in the sun. 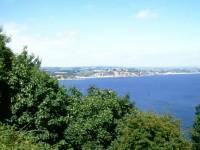 The town of St Austell, laying a couple of miles inland, is very prominent. 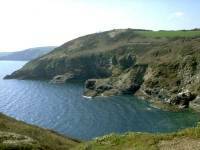 Right across the bay you will see the red and white tower on Gribbin Head, and a handful of miles beyond that the houses of Polruan are seen, crowding the slopes on the far side of the Fowey estuary. 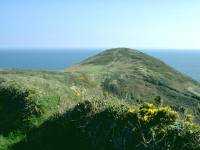 If the day is reasonably clear you should be able to see as far as Rame Head, which is six miles short of Plymouth and the end of the South Cornwall coast path. 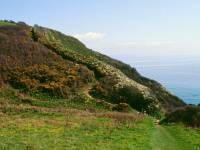 Follow the coast path downhill and into the woodland section above Ropehaven. 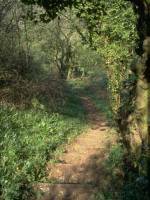 The ribbon of woodland above Ropehaven makes for a very pleasant interlude. 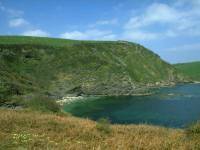 Ropehaven, apparently a former pilchard fishing station, is a private house down near the shore. 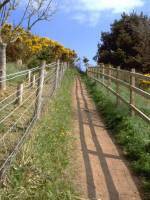 Its access path is private, but it crosses the coast path by a bench seat that makes a perfect spot to stop for lunch. There's a road just to the left beyond the trees. 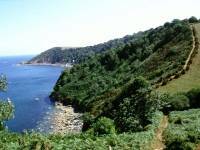 The coast path emerges from the trees a few hundred metres beyond Ropehaven, to reach another switchback section of cliffs and coves and steep gradients. 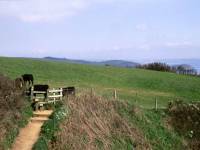 The next mile is an exciting one, a stretch of high scenic value, enlivened by the variety of vegetation - a mix of pasture, woodland and heath, with areas of cliff and rock thrown in for good measure. This really is a delightful section, packed with interest, and there's a temptation to use up a lot of film. 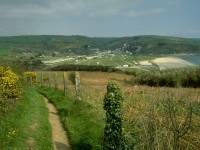 The path rises and falls, past Gwendra Point, Silvermine Point and Phoebe's Point, the scattering of white buildings that is Porthpean coming ever closer and adding to the general charm of the scene. 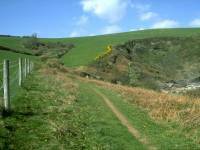 As you approach Porthpean the path tends rapidly downhill and temporarily loses itself among a thick covering of vegetation. 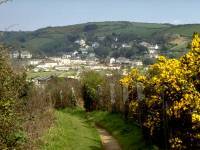 Higher Porthpean is to your right and you pass gardens that are a riot of colour. 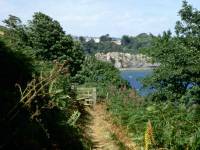 The path then gets itself together and runs just above an area of rocky foreshore to reach Lower Porthpean and its small but well frequented beach. 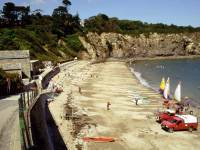 It's not immediately obvious why Porthpean Beach should be the scene of so much activity, until you look at the map and realise that the holiday village of Duporth lays just beyond, while the town of St Austell is just a couple of miles inland. 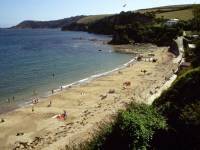 Effectively, Porthpean is St Austell's beach. 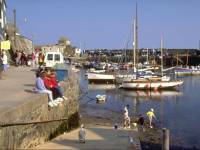 Porthpean has a shop and a beach cafe, and also a small sailing centre. The sails can make for some good photographs. 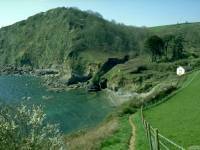 The coast path follows the sea wall just above the beach, and at its eastern end climbs a steep flight of steps. 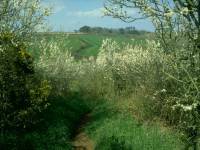 The path now cuts across the triangular headland of Carrickowel Point, which is screened by trees but which turns out to be an open patch of grassland if you take the trouble to explore. 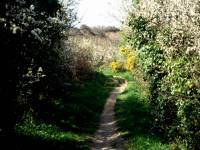 Halfway along the path behind the headland you reach a footpath going off to the left; this opens out onto a road that skirts the edge of the Duporth holiday village. 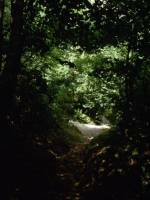 This road is your quickest route into St Austell - turn right at the junction 600m inland and walk north. 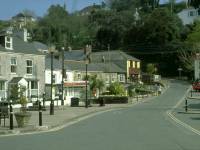 You'll reach St Austell in less than a mile, though it's a big place and it will be another mile before you reach the railway and bus stations just to the east of the town centre. 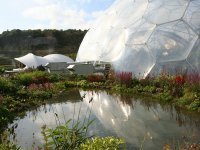 St Austell has all the facilities you will need at the end of a day's walk, including accommodation. 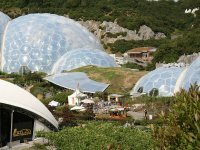 On the site of a disused china clay pit three miles north of St Austell is one of Britain's premier tourist attractions - The Eden Project. 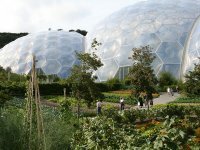 The purpose of the Eden project is to tell the story of mankind's relationship with, and dependence on, plants. 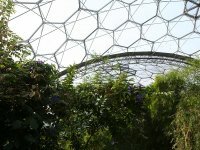 To this end the builders of the Project constructed the world's largest greenhouses, two "biomes" that mimic tropical and arid temperate climates respectively, and contain representative samples of just about every plant that Man uses for food, fuel, construction and countless other purposes. 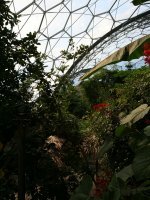 The Biomes form the centrepiece of the Eden Project but they are by no means the only part of it. 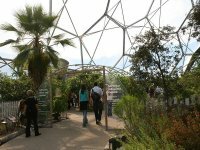 The domes themselves are linked by a huge two-storey facilities and catering area, and there are also educational, research, entertainment, exhibition and childrens' areas as well as the main visitor cenre / cafe / shop up on the top of the site. 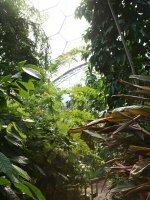 The slopes of the old pit are given over to a host of outdoor plants, mostly indigenous but including some exotics (such as tea) that manage to flourish in Cornwall's climate. 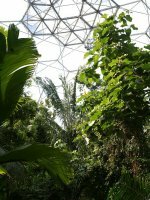 The Humid Tropics biome contains a wealth of exotic plants such as bananas, coffee, rice, pineapple, figs, sugar, rubber, spices, all kinds of tropical fruits, as well as timber species and plants that yield valuable products such as dyes and drugs. 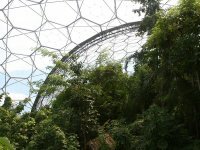 The biome itself is 240 metres long by 110 metres wide by 50 metres high, and the visitor route through the dome is a tortuous zigzag path that could take several hours to traverse if you study everything to the extent that it deserves. 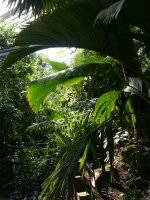 A watercourse, including falls and ponds, cuts through the middle of the biome. 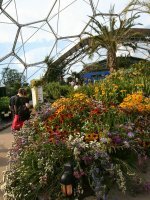 The Warm temperate biome sets out to recreate climates such as those of the Mediterranean, South Africa and California, and contains specimens of plants indigenous to those and other similar regions - citrus fruits, flowers and shrubs, vines, vegetables, nuts, grains, peppers, olives, grains, perfumes and tobacco. 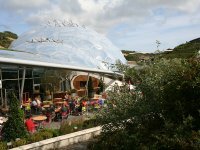 The Eden Project also hosts gigs and concerts as well as other entertainment events, particularly on summer evenings. 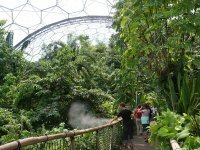 Since it opened in May 2000 it has welcomed well over a million visitors per year and is a splendid place to go if you fancy a day off from walking.